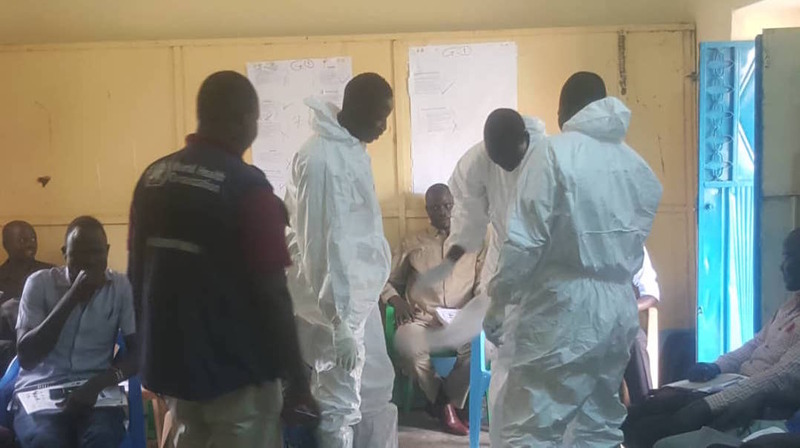 Juba 1 November 2018 – The World Health Organization is supporting the Ministry of Health of South Sudan, to train a total of 214 members of the Rapid Response Teams at the national level and in all the Ebola virus disease (EVD) high-risk states. These trainings are part of the ongoing efforts to strengthen the country’s preparedness capacities and mitigate the risk of EVD importation from the raging outbreak in North Kivu and Ituri in the Democratic Republic of Congo (DRC). The recent WHO EVD risk assessment raised the risk of regional spread from “high” to “very high” thus justifying all efforts aimed at enhancing national EVD readiness capacities. 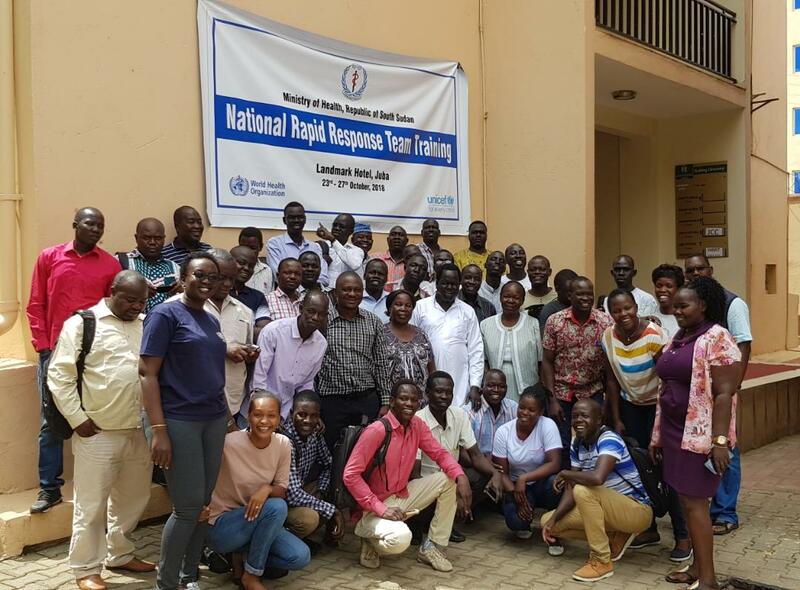 In line with the South Sudan EVD contingency plan that has prioritised strengthening of rapid response capacities, WHO and UNICEF spearheaded this process by training a total of 40 National Rapid Response Team members in Juba. This series of trainings is being rolled out to all the high-risk states with the aim of strengthening the capacity of multidisciplinary Rapid Response Teams (RRT) to provide them with the necessary skills in promptly investigating and supporting the initial response to suspected EVD outbreak alerts. RRT composition includes but not limited to clinicians, social mobilizer/anthropologist, logistician, psychosocial support, data manager, Infection Prevention and Control expert, and surveillance expert. The World Health Organization Country Representative for South Sudan, Dr. Olushayo Olu reiterated the importance of national capacity building, stating, “The training of the national and subnational Rapid Response Teams is one of the strategic priorities to enhance the country’s capacity to respond effectively to a potential importation of EVD cases into South Sudan”. Dr Olu recognised the contribution of all stakeholders and the donor community who have enabled strengthening of preparedness activities and capacity building against EVD as well as providing tailored and effective response to any other future outbreaks. The training is “hands-on” where participants are exposed through practical sessions structured around simulated scenarios on all key thematic areas of EVD outbreak response. Within this exercise, participants explored the various steps of an outbreak investigation and were also trained on the proper use of Personal Protective Equipment (PPE). Other priority risk mitigation measures that are ongoing include enhanced surveillance through routine screening of all travelers entering the South Sudan from the Democratic Republic of Congo (DRC) or Uganda by land or air, Risk communication and community engagement, Infection Prevention and control, case management, Laboratory, safe and dignified burial, and vaccination. A total of 39 points of entry in the high-risk states have been earmarked to serve as screening sites and 14 of which are now fully functional. WHO is fully supporting 2 of the major screening sites including Juba International Airport and Nimule. Work is ongoing to establish isolation facilities and make them functional by different partners. The Port Health facility in Juba International Airport was prioritised for EVD screening due to the high volume of international travelers using it to enter South Sudan. Consequently, the port health facility was upgraded to improve the quality of the EVD entry screening. The refurbishment has now transformed the initially temporary facility into a semi-permanent state-of-the-art facility that can effectively handle more passengers. The new block is more spacious and complies with the International Health Regulations (IHR 2005) point of entry recommendations. WHO acknowledges support from several donors including USAID, DFID, Canada, and Germany that are supporting the current EVD preparedness activities.